I love to create beautiful things. 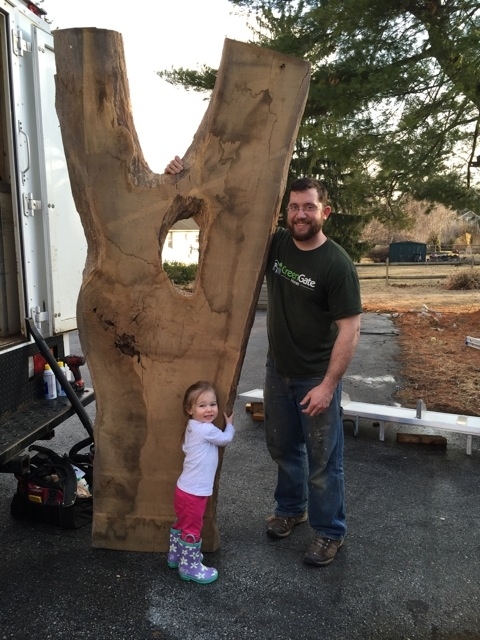 At Green Gate Woodworks, everything is custom built. Nothing is mass-produced, and no two pieces are exactly alike. I strive to design pieces that are pleasing to the eye and touch, while being highly functional for my clients. Please browse the galleries below to see the unique projects I have had the privilege of creating. I grew up in Wayne, Pennsylvania and currently live in near-by Chester Springs. I have been self-employed for over 25 years, starting my first business when I was 12. I started out doing landscaping and tree work, continued this through high school, and then went on to earn my bachelor’s degree in landscape architecture from Temple University. After graduation, I began renovating and reselling properties on the side. This led to a full-time career in construction. In my contracting experiences, I found I was drawn to the finer end of things: the trim work and more detail-oriented aspects of the jobs where I could apply what I learned about design in college. Over time, I began furniture and built-in construction which allowed me to continue to design and create, albeit in a different medium than landscaping. I enjoy the artistic aspect of it, and coming up with custom solutions allows me use my creative problem solving skills. As a result of the path I took and how my interests developed over time, I now create custom furniture, cabinetry, built-ins, mantles, and other woodworking projects as shown in the picture galleries above. Although I have moved away from it as my primary focus, I still provide general contracting services for larger renovation projects to help fill in my schedule as needed. Click here to see pictures of those completed projects. One of my ongoing projects is the construction of my own home in Chester Springs. I am doing the majority of the work myself in my spare time - including building my own cabinets, built-ins, etc. - which is why it is a much more long-term project than normal. As with all my projects, I am building my own home to be around long after I am gone. I want it to be here one day for my daughters to enjoy and hopefully their children and beyond. On your project, I want to do the same for you and your family. If you'd like to see pictures of my personal home renovation project, please click here.